Learn more about the tuition process and fees. 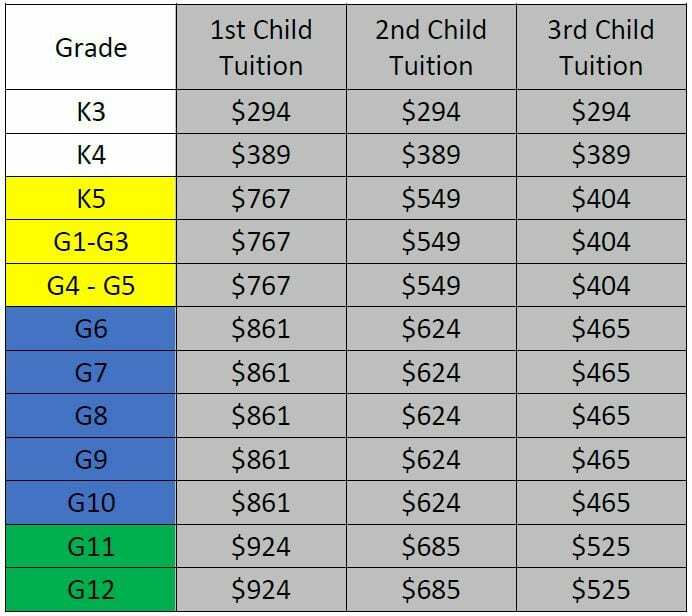 The tuition grid has been tied to IB Progammes. The average overall increase is 5%. The maximum tuition per family has been increased to $1,785. The total amount (school fees and tuition) includes all mandatory fees (retreats, field trips, music trips up to G8, G5 music rentals, IB exams and basic grad fees), and it would not include optional fees (music trips G9 and above, G6 and above music rentals, athletic fees, skiing, MSL trips and extra optional grad fees). School fees have also been grouped based on the IB Programme instead of the actual per grade amount paid in the past. – This method of payment will receive a 2% discount if payment is received before September 15th. Please note that the discount applies to tuition only. – If paying-in-full by cheque, a pre-authorized debit form is still required which will authorize the $400 forfeit for non-completed volunteer hours in June. Simply omit the amount to withdraw section of the PAD form. PADs can be processed on the 1st or 15th of each month. Individuals choosing a 1st of the month withdrawal are to submit the PAD form prior to Aug 25th. Individuals choosing a 15th of the month withdrawal are to submit the PAD form prior to Sep 5th. Individuals who hand in the forms after the above deadlines are to issue a cheque for the month of September. If the Waiver of Pre-Notification is signed, there is no need to complete another PAD form in subsequent years. PAD cancellations for the following year can be submitted by written request via email by August 20th to accounts@wrca.ca. Please indicate on your completed PAD form the name(s) of your child(ren) attending WRCA.